vibrant colors. frothy fabrics. indelible style. Our nursery’s theme is something along the lines of woodland creatures. 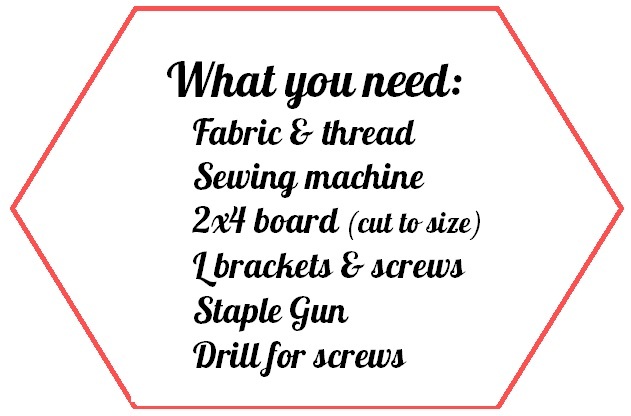 So far I’ve only been working on sewing projects for the space, so up to this point it looks like a showroom for my novice skillz. Skillz with a Z. Get over it. 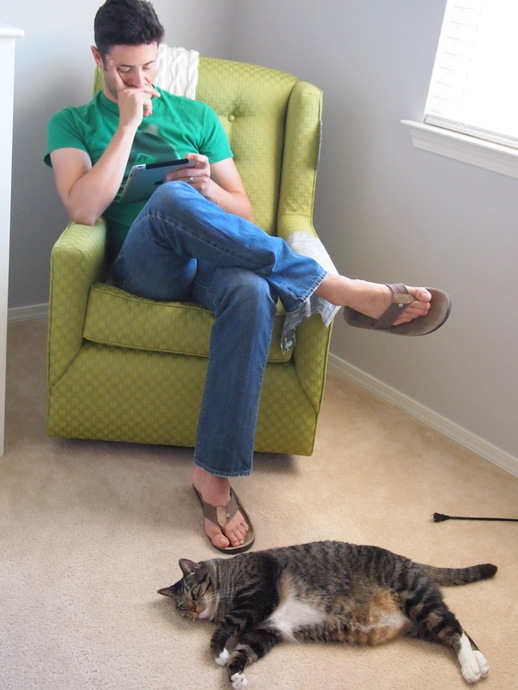 Anyway, the room is in dire needs of wall art. 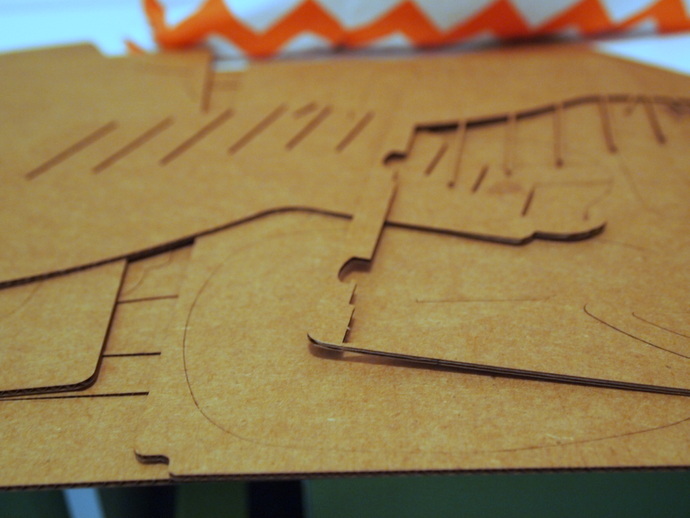 I have a few ideas in mind, but while ruminating on those, I came across Cardboard Safari. 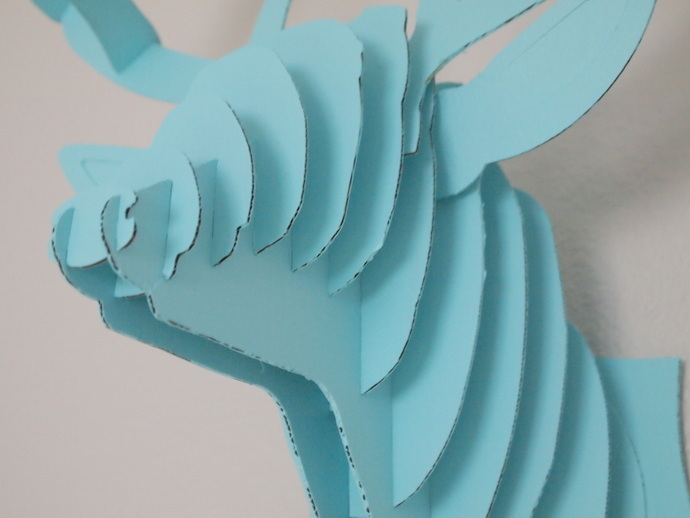 This little business makes animal busts out of cardboard that you assemble and hang on your wall. Talk about whimsical fun! 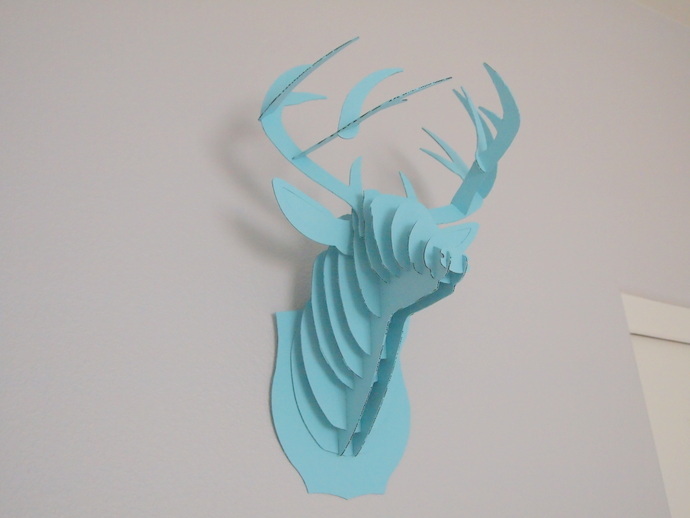 So, I ordered a small buck bust for the nursery. When it arrived, I assembled it and it seemed…. unfinished. I contemplated what to do. Do I cover it with paper? Do I decorate it with a bedazzler? I eventually opted for the high-risk route of painting it. Paint + cardboard = certain disaster, right? At first, I felt like I made a huge mistake. As in, I almost threw the whole thing into the garbage a few times. Each side took three layers of paint, and I was certain the whole thing would turn out terribly. However, I stuck with it. Tenacity, am-I-right? I’m glad I did – the project actually turned out pretty well. The moisture of the paint did warp one or two of the cardboard pieces just a tiny bit (where they bowed in a certain direction), but that was straightened out once painting was finished and I reassembled the bust. I think the final result adds a fun element to the nursery. I used Martha Stewart’s craft paint in Satin, color Surf. 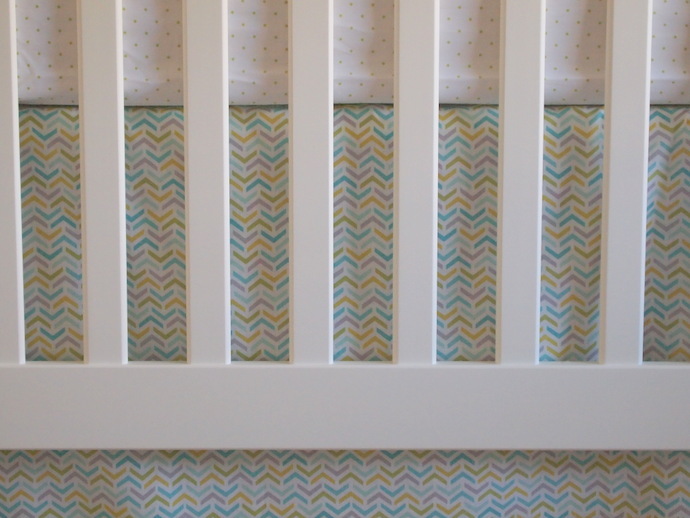 Crib bumpers are one of those obnoxiously controversial items in the baby world. Whenever I utter the phrase “crib bumper” I feel like it should be followed up by this. So, I am going to preface this post by saying I am not going to have the crib bumper (this again) and my baby in the crib at the same time. 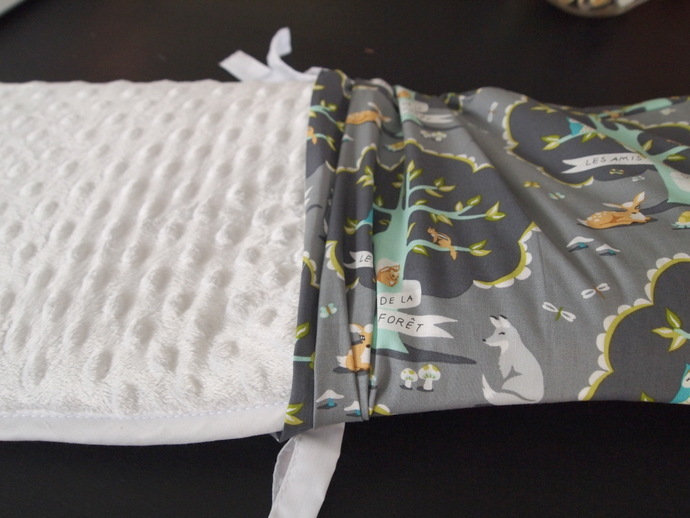 For those of you who live in fear of crib bumpers (yup), recognize that I am using it as a decorative item that will be in the crib when the baby is not. Save the lectures for someone who cares about your concerns. I’m pretty sure that is why Internet forums exist. Now that my disclaimer is out of the way, I can proceed with my fun sewing project. I have sat on this project for weeks and weeks. 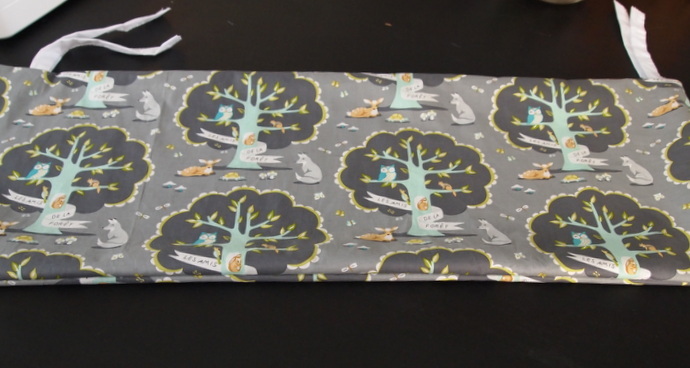 Mostly out of worry that I would irrevocably screw up the project and I’d be out of fabric and patience. Ends up the project was substantially easier than I originally assumed. The crib bumper came in four separate pieces, instead of my envisioned-single-super-long-impossible-to-work-with-piece. That meant I was able to recover each section of the crib bumper as I would a throw pillow. Step 1: Iron fabric, measure it, and cut. You will need enough fabric to cover both sides of the bumper, plus the hem. You may need to iron your fabric again. 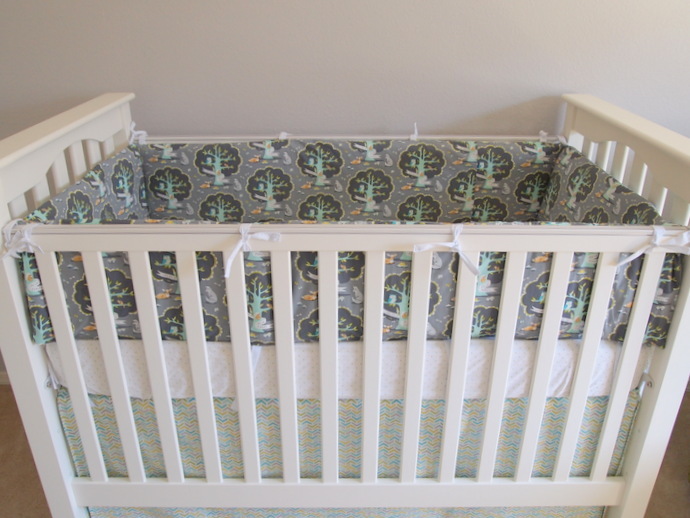 Crib bumpers come with ties already attached. 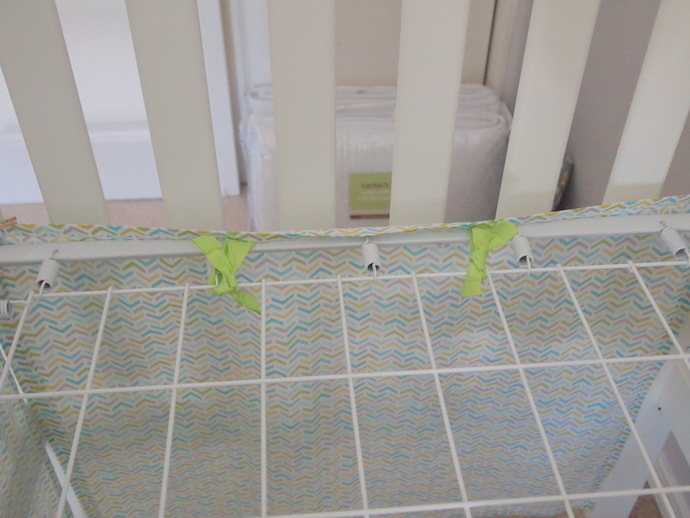 To save yourself a step in making ties (unless you need to do a color match), cut the ties off the crib bumpers and pin them to your fabric. Make sure the ties are in between the fabric pieces, the ties going inward to ensure you sew the ties on correctly. Step 3: Sew three sides of the fabric cover together. Leave one short end open. 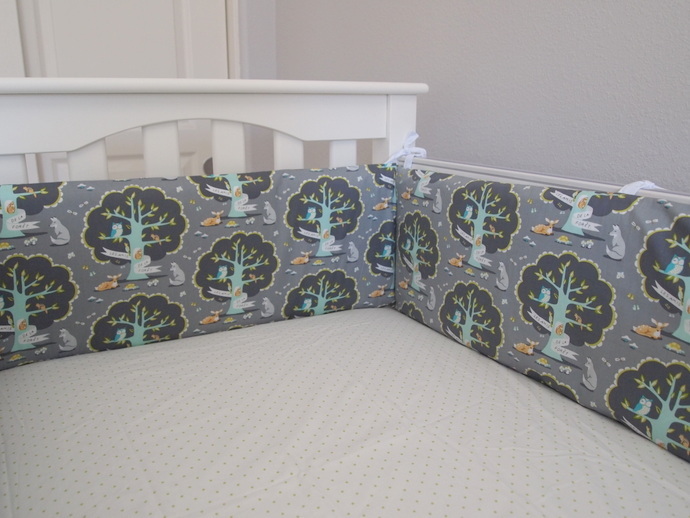 Step 4: Stuff crib bumper into fabric cover. Close last end with a hidden stitch. Here is a tutorial on how to do a hidden stitch. 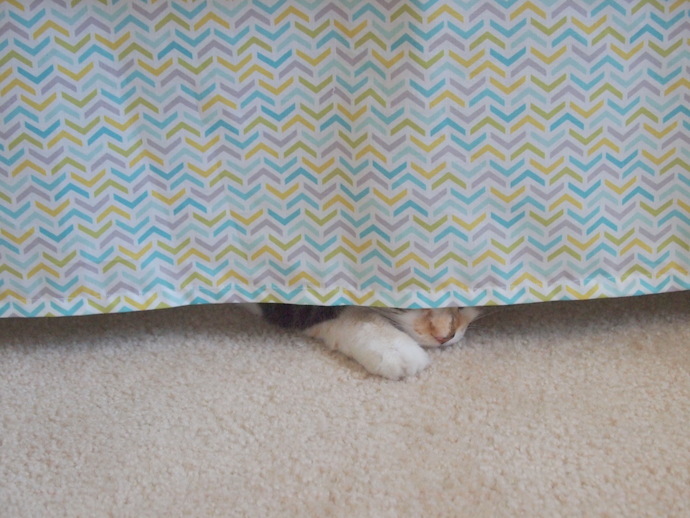 Crib skirts. This is something that you don’t know you need until Pottery Barn tells you otherwise. Well, “need” is a strong word. 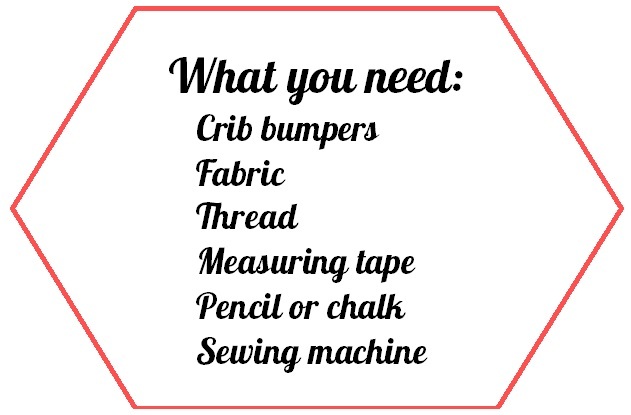 You “need” a crib skirt like you “need” most things from a place like Pottery Barn. But the lines of “need” and “want” blur together and that’s how it goes. However. For $60 I’m not falling for their game. Not when it’s nothing more than a rectangular piece of fabric that drapes down from the crib mattress (sold separately from the crib and all other features, mind you) in basic white with a detailed line running through it. I can do better than that. 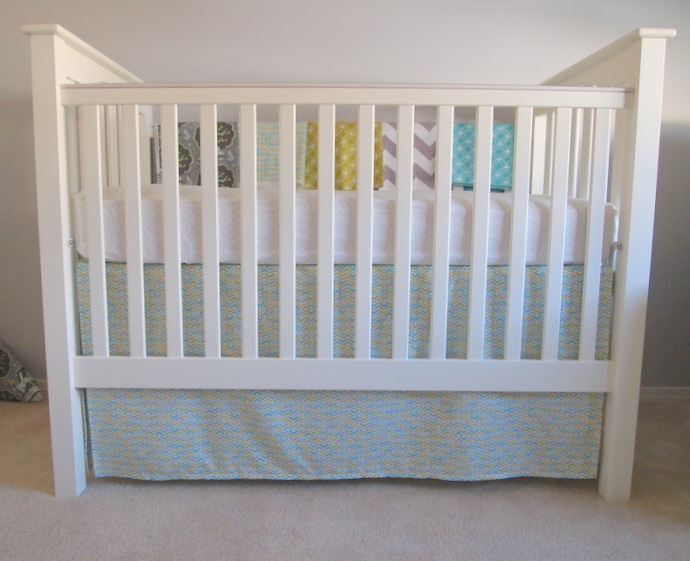 Step 1: Measure the width, depth and length of crib for your crib skirt. Iron the hems and hold in place with sewing pins. 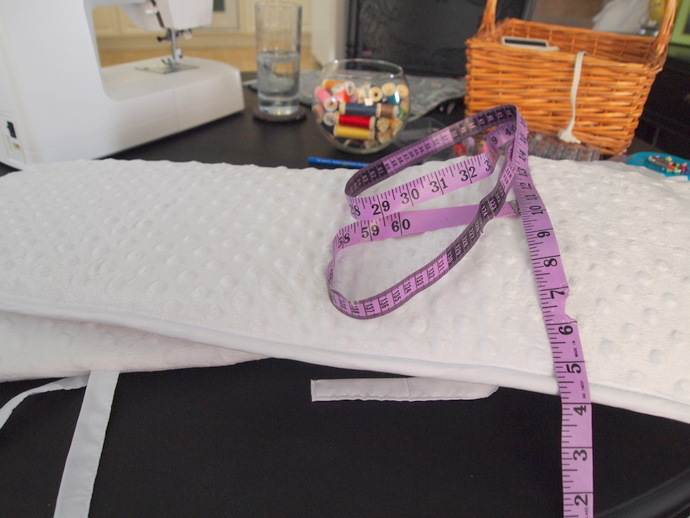 Step 2: Measure and cut fabric. I did a separate fabric panel for each side. This allows customization of tying on the material with the hardware of the crib. Don’t forget to factor in one inch for each side to sew the hem. Step 3: Pin ties to tops of each side. Make sure you have ties for the corners as well as the middle of each panel (I forgot about that and had to add on corner ties after the fact). Step 4: Sew hems and ties together. 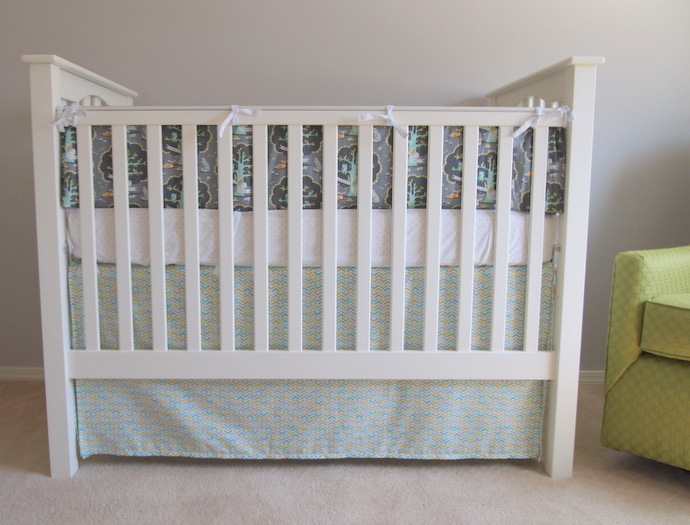 Tie panels onto the crib. It seems that everyone is enjoying the nursery these days. As I posted last week, I’ve been working on various projects for the nursery for this life we are bringing into the world (crap-crap-crap-crap!). 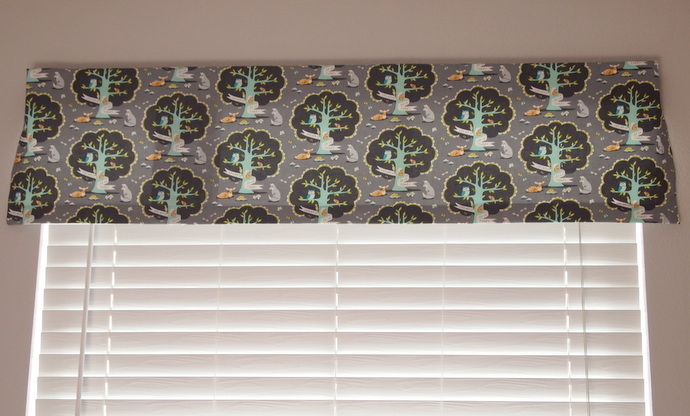 The first project I took on was creating and building a valance for the window. It ends up being a very easy project with BIG results. I find myself sitting in there admiring my work – and I know how easy it was to make! I didn’t document the steps as I normally do with pictures, so hopefully my written instructions suffice. And if they don’t suffice…. eh. I can’t muster the umph to come up with a witty response that doesn’t borderline on inappropriate or bitchy. Lay your board flat on the ground and calculate the measurements for your fabric. I painted my 2×4 the same color as the walls, but this step isn’t necessary. You’ll need enough fabric to run the length of the board, as well as the edges on either side, plus an inch on either side for the hem. Fabric length can vary on preference – but I recommend 10-12 inches (add an inch on either end for the hem). Measure your fabric at least twice and double-check your calculations before cutting anything. Once you are sure, go ahead and cut your fabric. 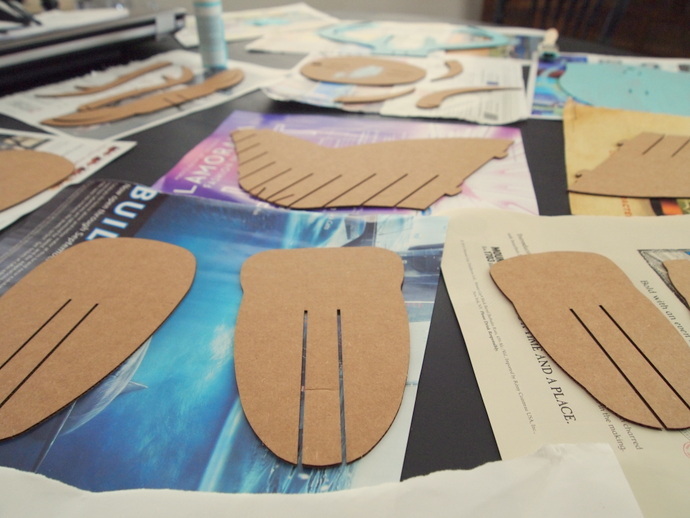 I swear, the actual sewing part of any project is sidelined by all the prepping a person does. If your fabric is thick or heavy, then don’t worry about lining it. If your fabric is thinner, like mine, then you may want to line it. 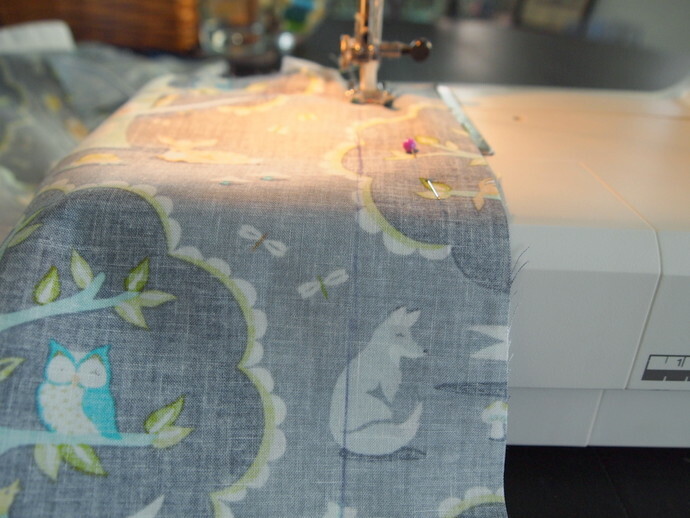 Lining the fabric is simply cutting out a light, solid material to the size of your valance fabric and sewing it together. Make sure your fabrics are ironed completely and pinned together to ensure no wrinkles or folds. Measure where you want your hem to be. 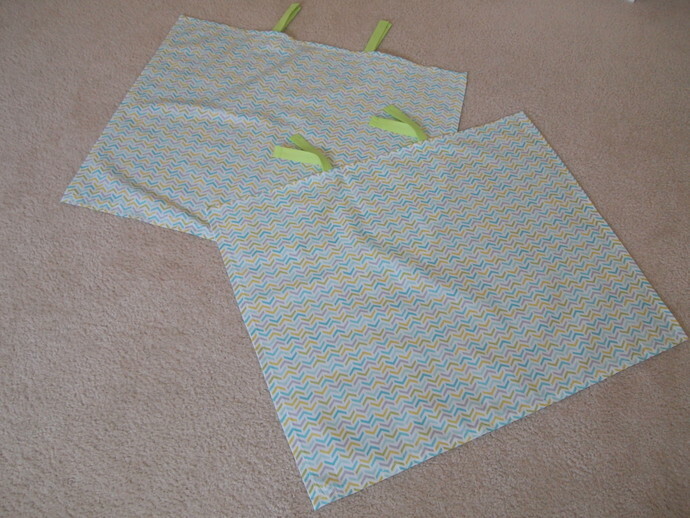 Usually you will want to fold over the edges of the fabric twice, so 1/2 inch for each fold, 1 inch on each side. Mark the measurements with a sewing pencil or chalk. 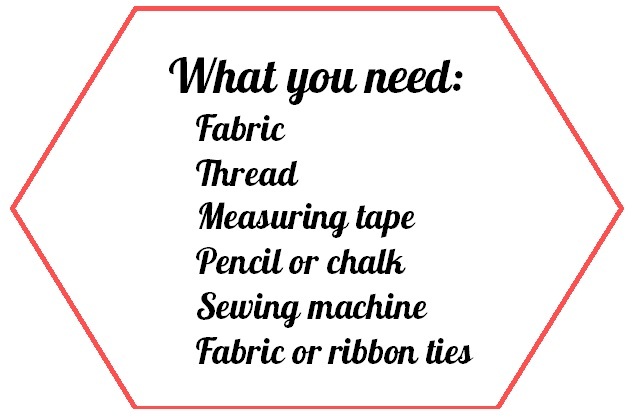 Iron the hems of your fabric, following your measurement marks, for ease of straight sewing. Pin the hems for extra hold while you sew. Sew the hems of your valance fabric close to the ironed edge of the hemline. Iron again if necessary. This step may take two people – one to hold the fabric in place and the other to staple. Lay out your fabric on the ground and place your 2×4 over it. Make sure the ends of the fabric will go around the board – at least a 1/2 inch to the back of the board for stapling. Staple one end of the fabric to the board, folding over the edge like you would wrap a gift. Staple going down the board, which will help keep the fabric taut. When you reach the other end, staple your fabric in the same fashion as the first end. This step will definitely take two people. One to hold the valance and the other to screw it to the wall. Drill the L brackets onto the valance, flipping up the fabric and drilling part of the L bracket to the 2×4, and leaving the other side free (to be drilled into the wall). Measure your wall and hold the valance up above the window. Use a level to ensure evenness of the valance. While one person holds the valance in place, have the other person drill the screws into the open spots on the L brackets. Make sure your fabric isn’t tucked behind the 2×4 where it might get stuck after you are finished hanging it.